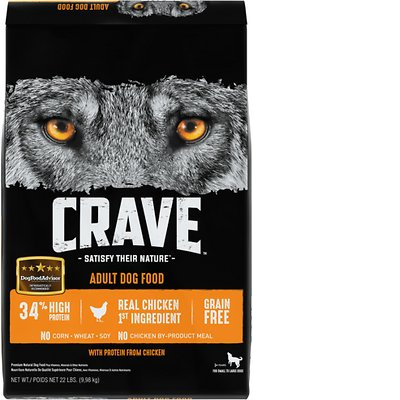 Crave Chicken Pate with Protein is an exceptional quality dog food with a low price. This product has no controversial ingredients with zero artificial preservatives, colors or flavors. It has a relatively well-balanced amount of protein, fat and carbs with excellent meat and fat quality. Crave has a below-average number of recalls and was overall very transparent when answering our questions. Watchdog Labs highly recommends this product. Chicken, Chicken Meal, Chickpeas, Split Peas, Pork Meal, Chicken Fat (preserved with Mixed Tocopherols), Dried Potatoes, Lamb Meal, Pea Protein, Natural Flavor, Dehydrated Alfalfa Meal, Dried Plain Beet Pulp, Choline Chloride, Potassium Chloride, DL-Methionine, Salt, Mixed Tocopherols and Citric Acid (preservatives), Zinc Sulfate, Niacin Supplement, Biotin, Vitamin E Supplement, Iron Amino Acid Chelate, D-Calcium Pantothenate, Selenium Yeast, Riboflavin Supplement (Vitamin B2), Copper Amino Acid Chelate, Vitamin B12 Supplement, Pyridoxine Hydrochloride (Vitamin B6), Manganese Amino Acid Chelate, Vitamin A Supplement, Thiamine Mononitrate (Vitamin B1), Vitamin D3 Supplement, Folic Acid, Rosemary Extract. The average dog food we reviewed has 39 total ingredients, with 1 controversial ingredient. This product has 0 total controversial ingredients - very nice! No controversial ingredients are included in this dog food. 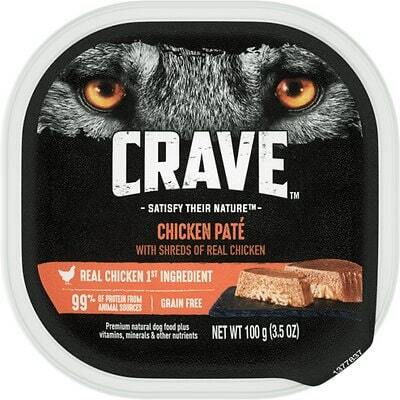 Crave with Protein from Chicken Adult is made in the United States. That’s great, because the dog food laws and regulations in the USA are higher than many other countries. All meat and fat sources in this dog food clearly show which animals they come from, that’s a sign of quality: Chicken, Chicken Meal, Pork Meal, Chicken Fat (preserved with Mixed Tocopherols), and Lamb Meal. It’s great when products transparently show their ingredient sources. Crave with Protein from Chicken Adult includes no artificial colors. That’s how it should be! Crave has a below-average number of recalls. Crave is part of the Mars family of brands and was pretty responsive. It only required one email, and they responded in 4 days. Not lightning fast, but compared to the average it was good response time.